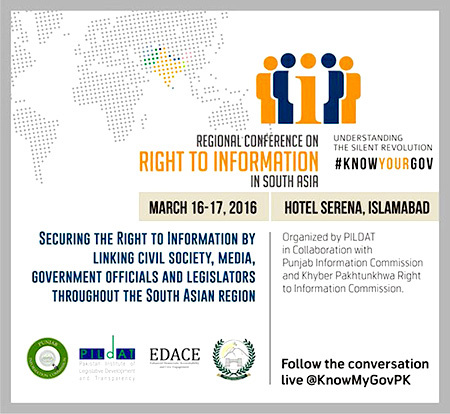 Islamabad, March 15: Campaigners, media persons, academia, government officials and legislators spearheading local Right to Information (RTI) movements in the region are scheduled to convene in Islamabad tomorrow for the first-ever 2-day Regional Conference on the RTI in South Asia. The Conference is being organised by PILDAT in collaboration with the Khyber Pakhtunkhwa Right to Information Commission and the Punjab Information Commission, which are dedicated government agencies responsible for implementing RTI within their respective provinces. Participants from Bangladesh, India, Nepal, Pakistan and Sri Lanka will convene between March 16th and 17th to share their experiences in strengthening RTI within their home countries, and enhance regional cooperation for the continued success of such local efforts in the future. This year’s Regional Conference on the Right to Information in South Asia, called Understanding the Silent Revolution, includes a series of Panel Discussions in which over 20 nationally and internationally renowned speakers and panelists will discuss Regional Conference themes, both among themselves and with the wider public. During the 2-day Conference Programme, the session to be led by Chairperson, Senate Standing Committee on Defense, Senator Mushahid Hussain Syed on Protecting and Disclosing Sensitive Information under RTI will discuss the ways in which different countries have balanced the principles of RTI with the need for protecting sensitive information on national security and foreign affairs from disclosure. The session to be chaired by Founding Member, Mazdoor Kisan Shakti Sanghathan, Rajasthan, Mr. Nikhil Dey on Civil Society and Media in the RTI Movement will outline the role of civil society and media in supporting more effective RTI implementation and advocacy. The session to be chaired by the Chief Information Commissioner of Nepal, Mr. Krishna Hari Baskota on Promoting Government Openness and Accountability through RTI will highlight the impact of RTI on the functioning of governments and the challenges for effective implementation of RTI within public offices. The session to be chaired by Co-convener, National Campaign for Peoples’ Right to Information, New Delhi, Ms. Aruna Roy on Opening Parliament to Citizens through RTI will cover how civil society and the media can use RTI to assess the performance of legislatures, and the impact this increased public scrutiny has had on citizen-state relations. The inaugural session chaired by PILDAT President Mr. Ahmed Bilal Mehboob on Overviewing the Right to Information in South Asia and the World will review the progress made by RTI movements in South Asia and the rest of the world. PILDAT also organised a Media Awareness Workshop in Islamabad today, titled Landing the Story: Using RTI in Investigative Journalism, in which members of the electronic and print media from all over Pakistan were addressed by national and international experts, including Founder, Association for Democratic Reforms, New Delhi, Dr. Jagdeep S. Chhokar, and Bureau Chief, Online News Network, Karachi, Mr. Aamir Latif. Participants agreed that RTI could be used as a powerful tool to expose corruption and wrongdoing within government after reviewing relevant case studies from India and the United Kingdom. The Media Awareness Workshop and the Regional Conference on RTI has been organised by PILDAT under the More Effective Right-To-Information at Federal and Provincial (Sindh and Punjab) levels project, for which it has received financial support from the Development Alternatives Inc. (DAI) under the Enhanced Democratic Accountability and Civic Engagement project.